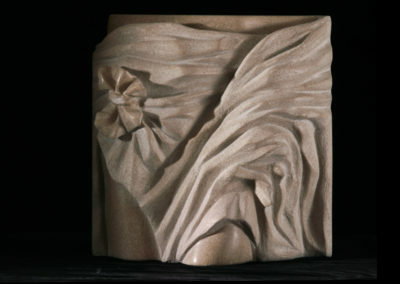 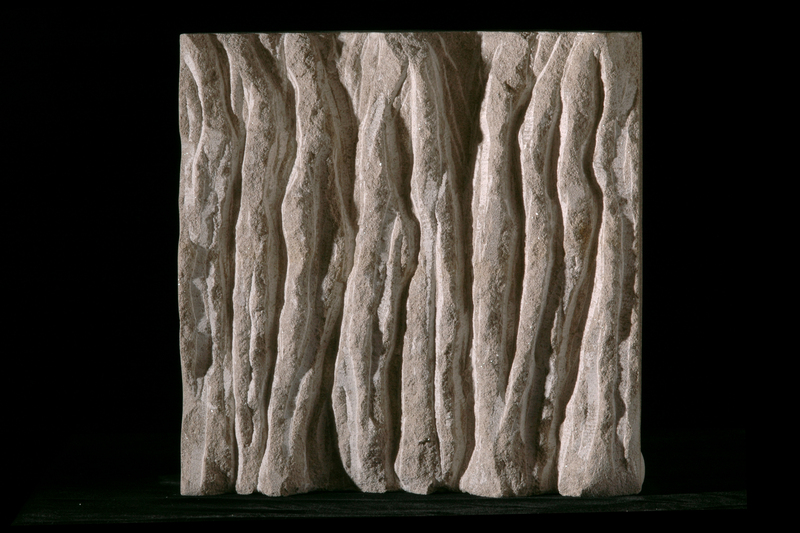 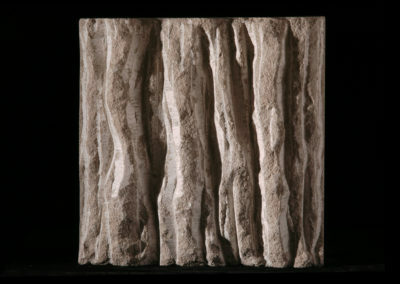 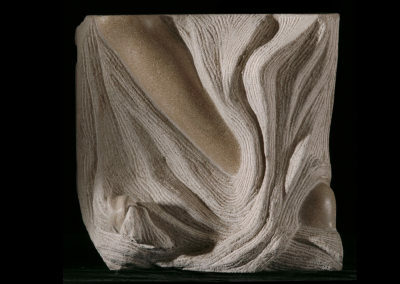 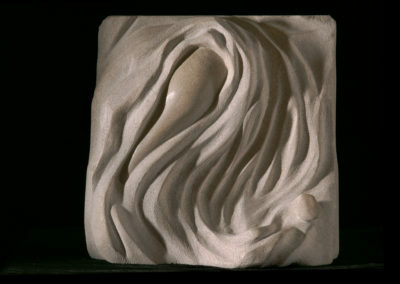 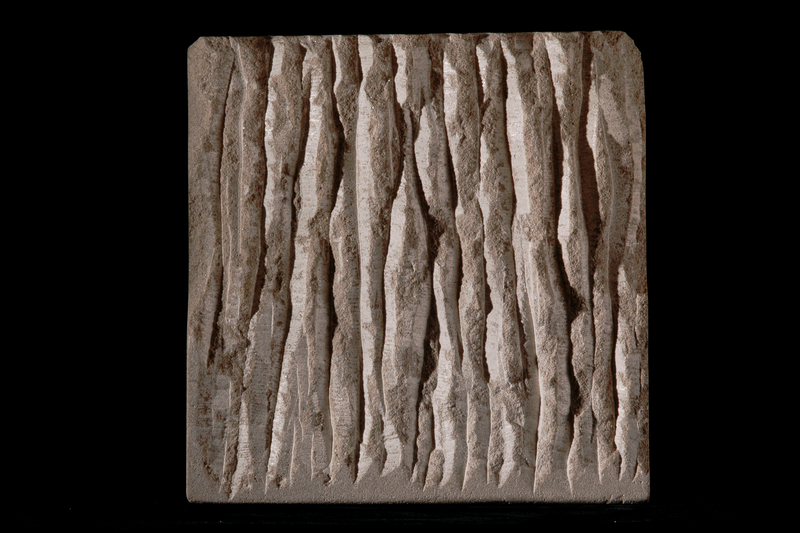 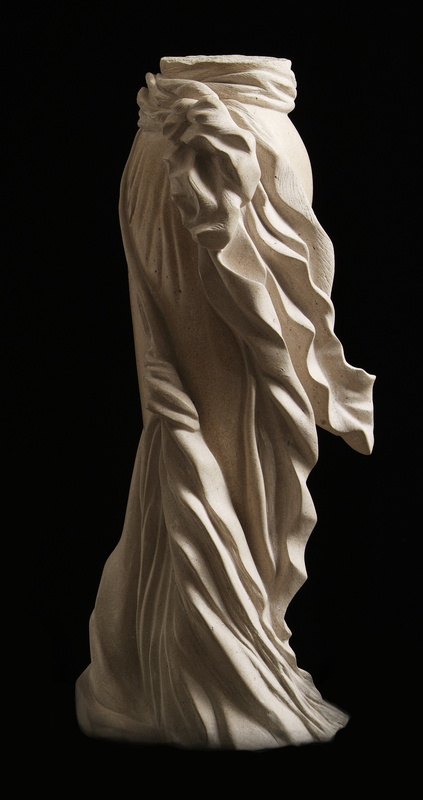 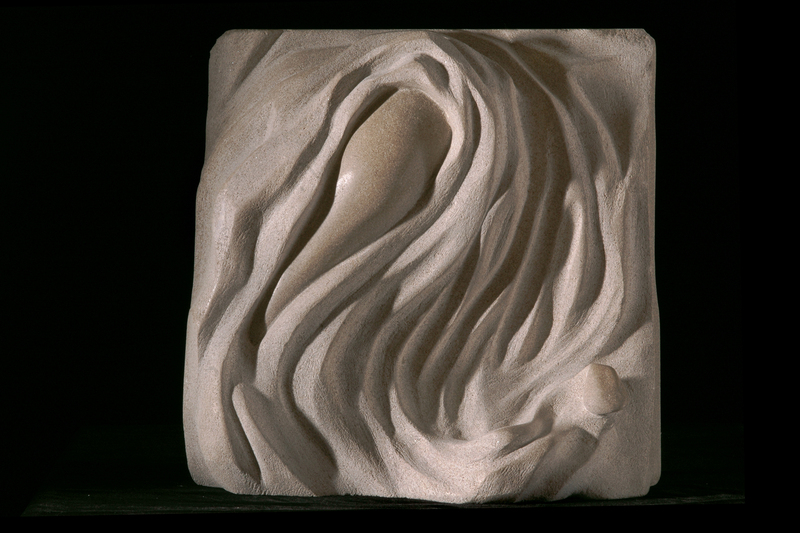 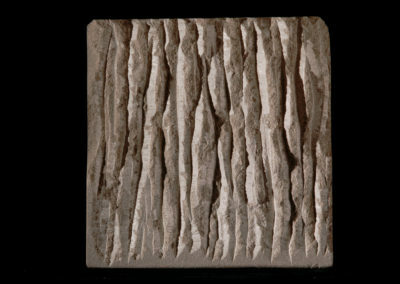 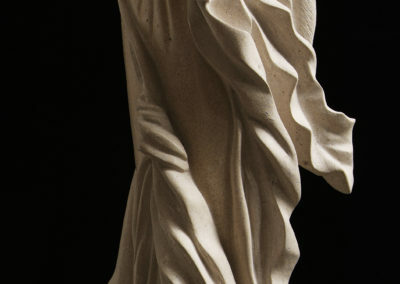 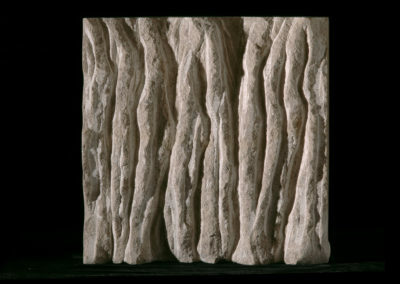 For many years I carved hard stone to appear as soft and flowing as cloth and as fluid as water. 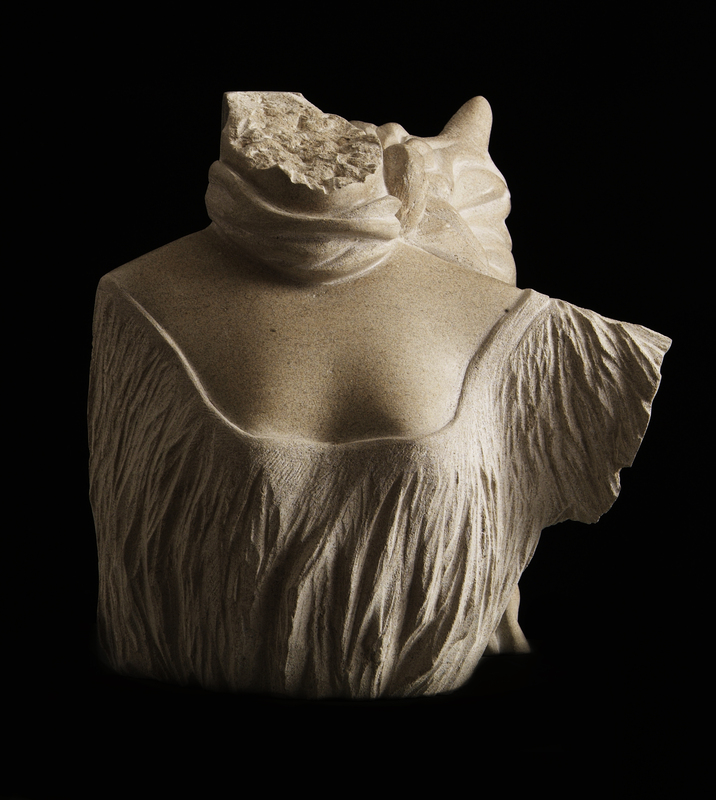 With this series I became less abstract and actually represented fabric in the fragments of robes and gowns. 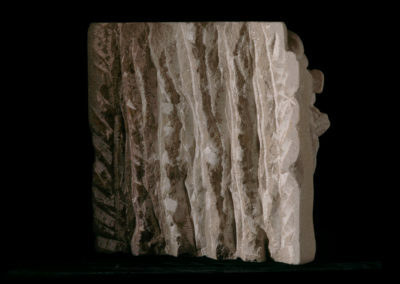 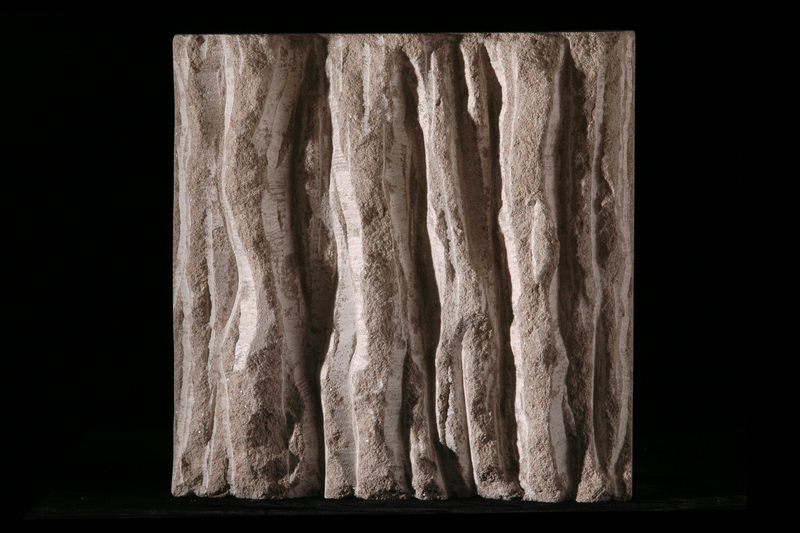 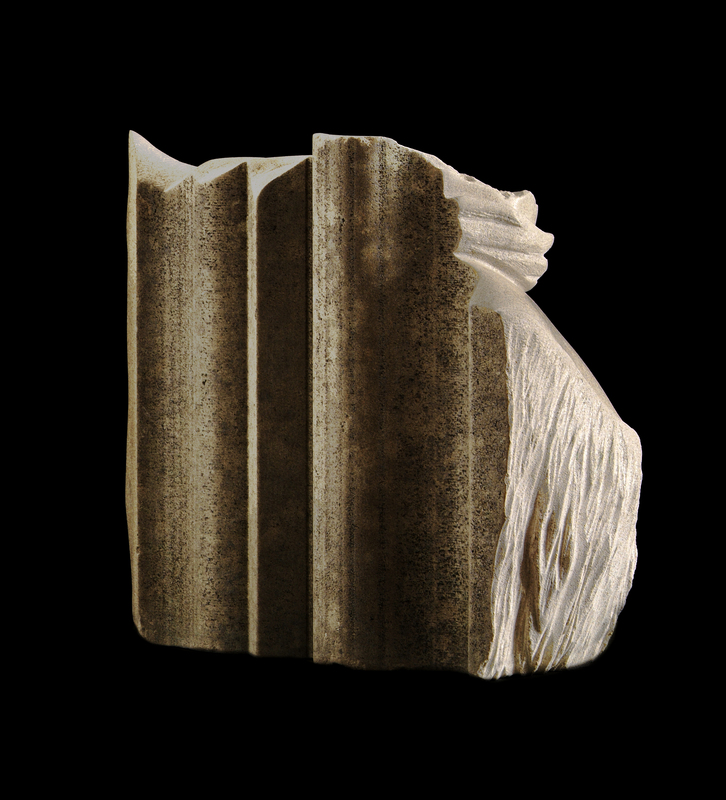 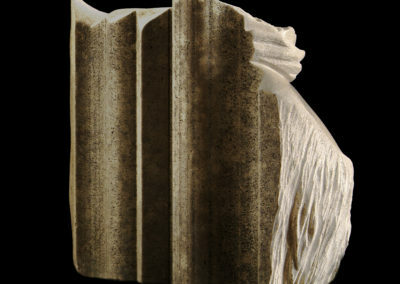 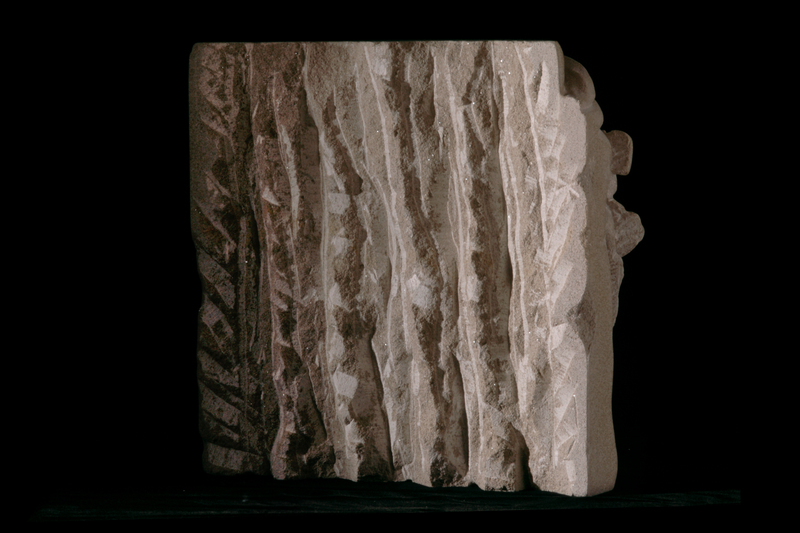 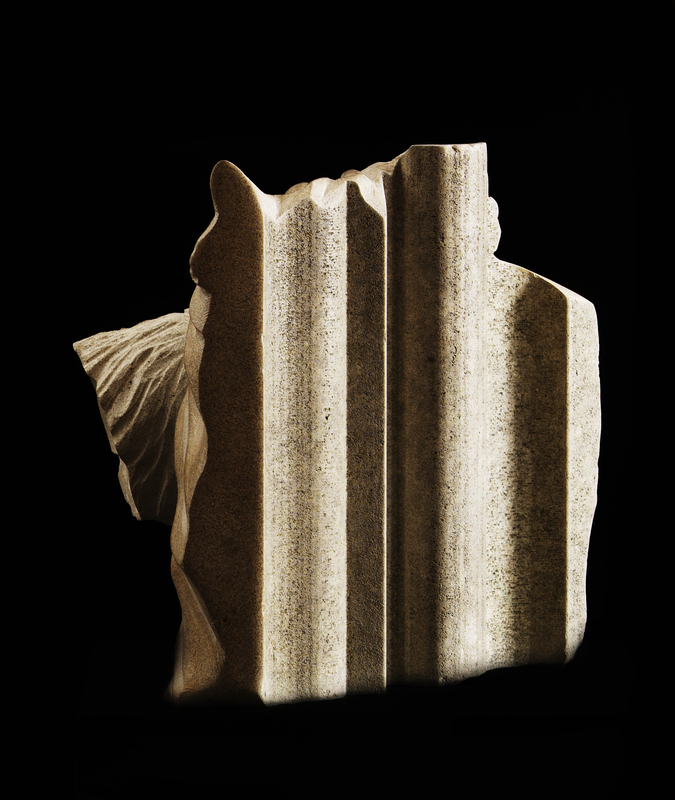 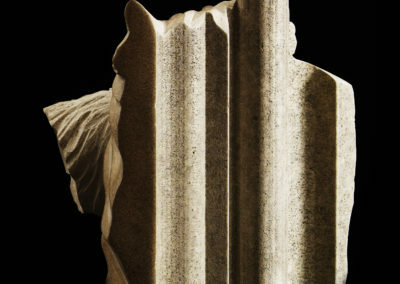 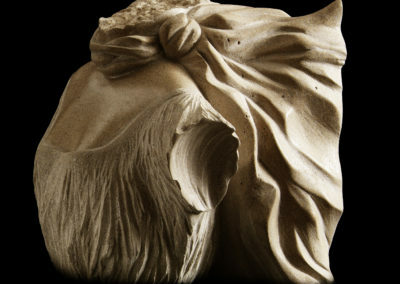 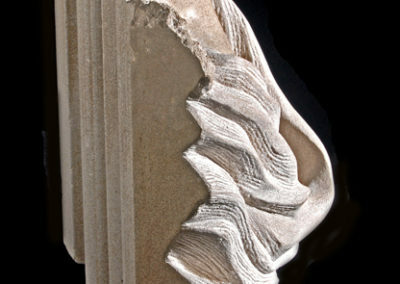 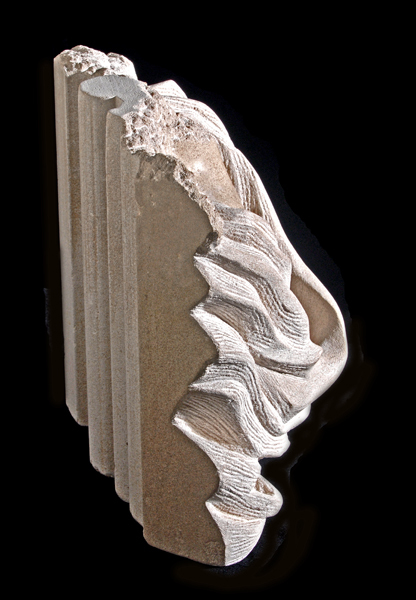 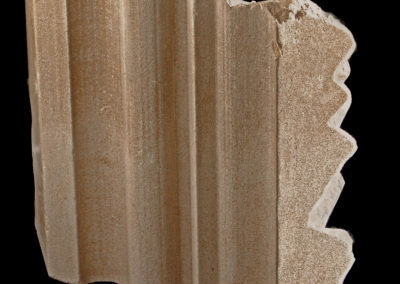 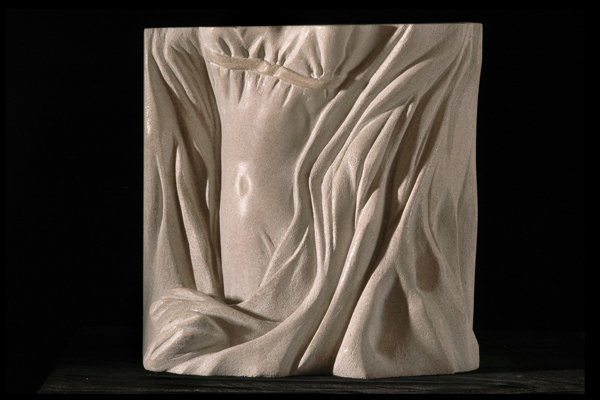 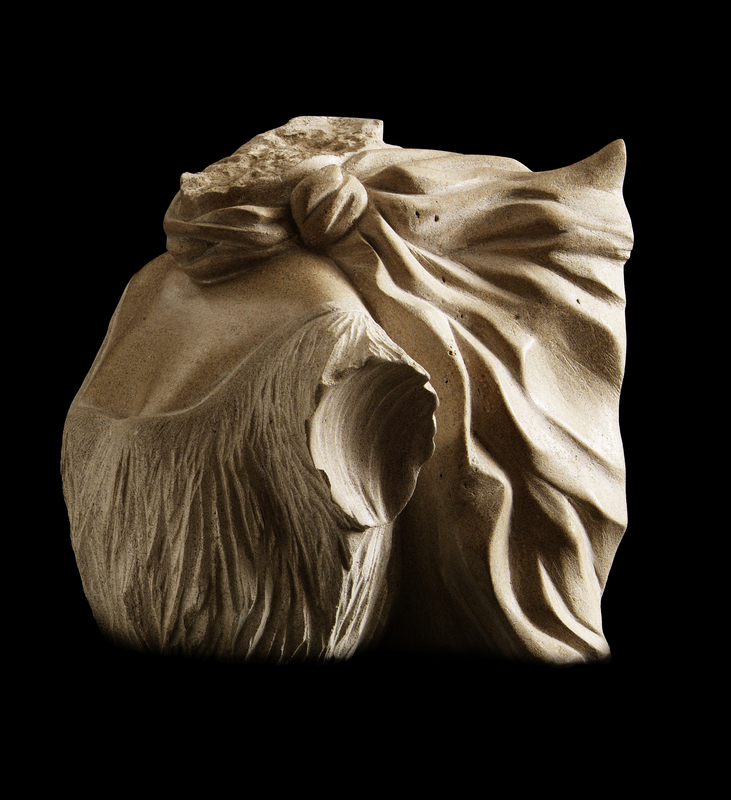 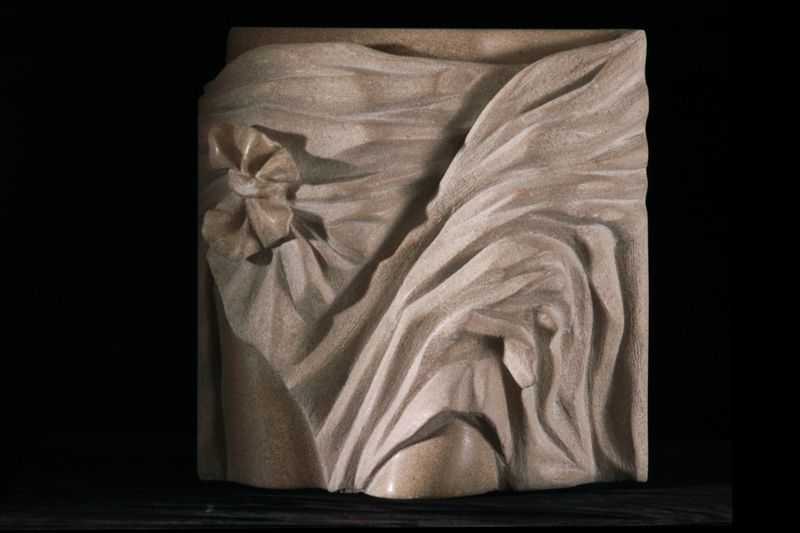 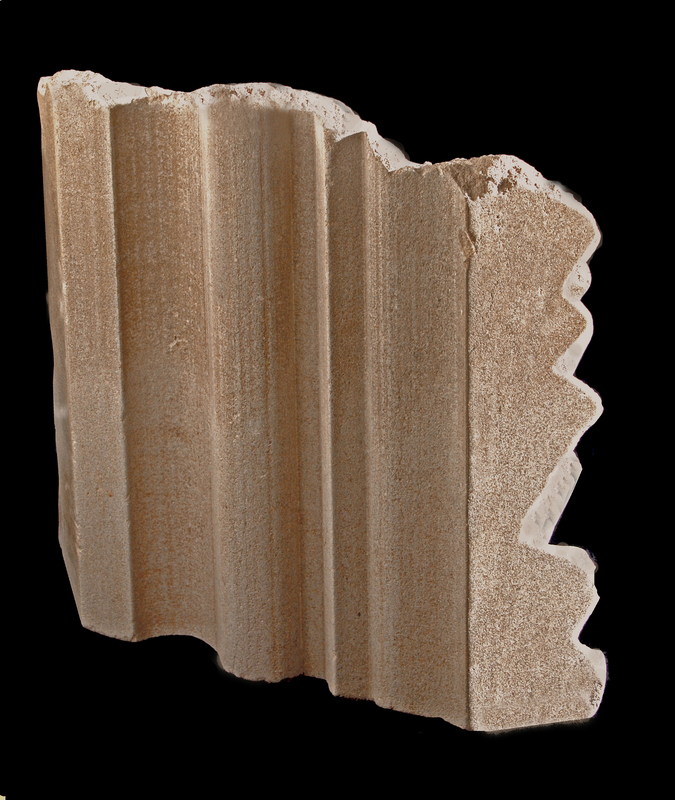 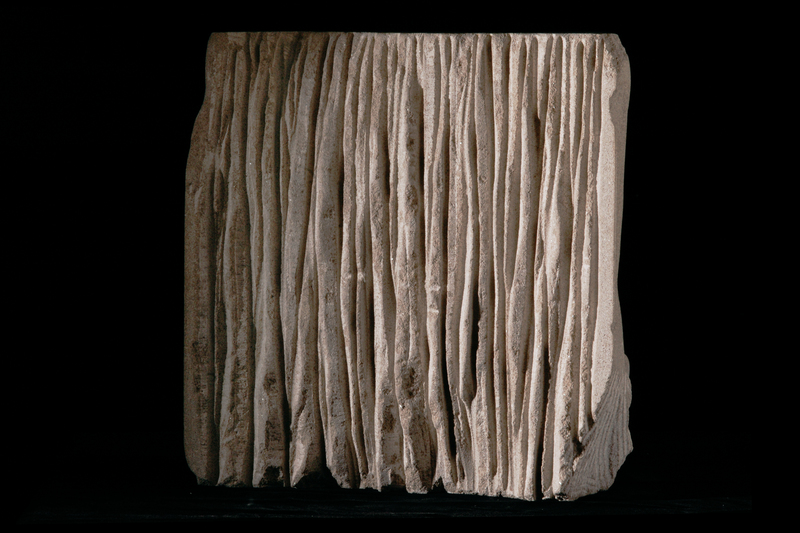 As with the Elgin Marbles, removed from their architecture, this series presents segments of reliefs cut from their source as if they have been pulled from the ruins of our collective and individual pasts. 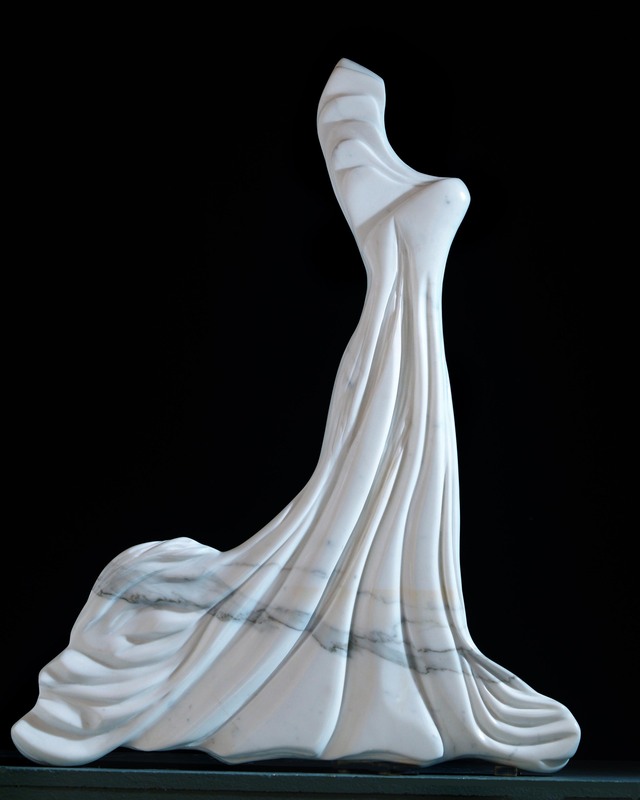 The Robe is the mantel for the spirit of beauty, power, and love ready to be stepped into. 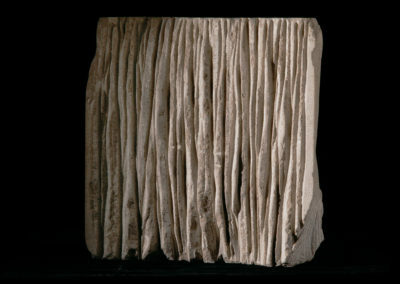 The skirt carved from limestone, might have come from a ruined Classical temple perhaps part of a column. 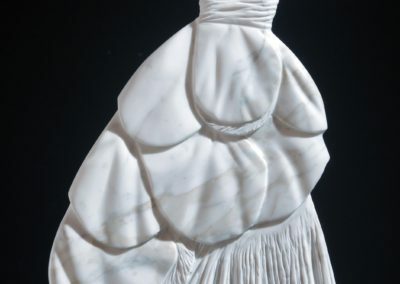 Carving this skirt satisfied my wish to design a beautiful gown that has the flounces and folds of fabric. 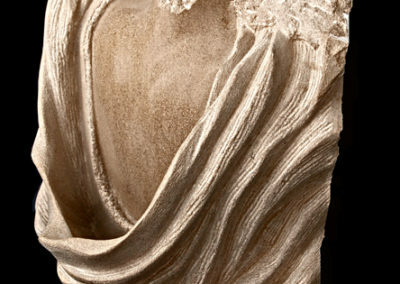 With our clothing we manifest our uniqueness, our love of beauty, texture and flow. 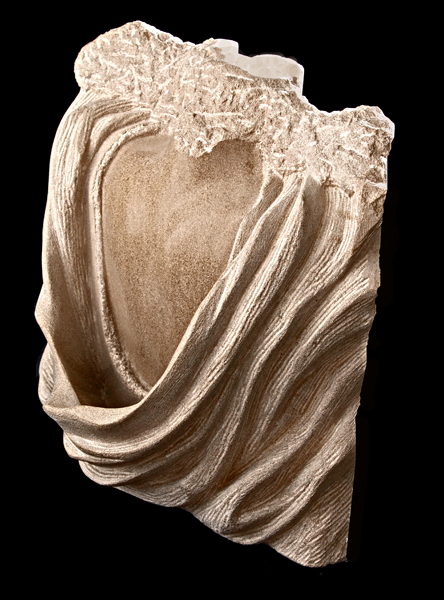 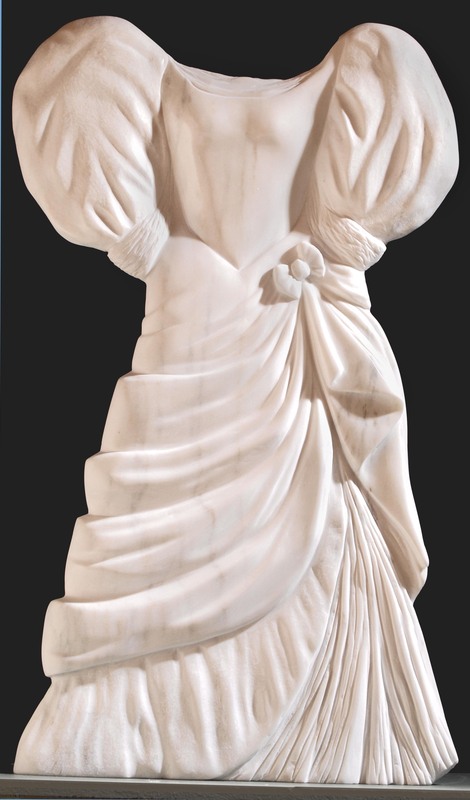 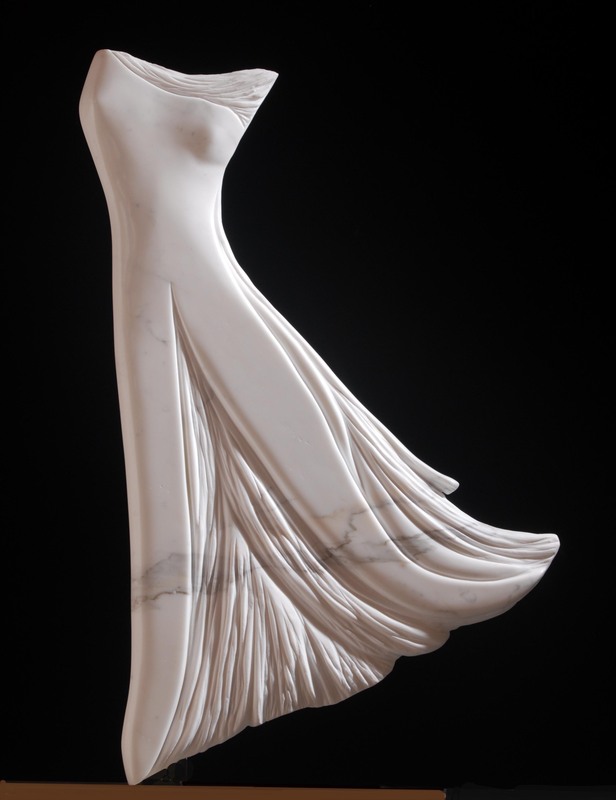 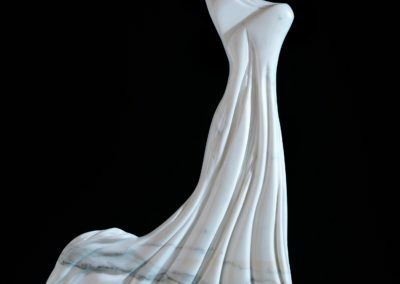 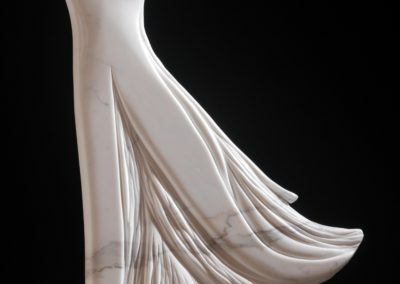 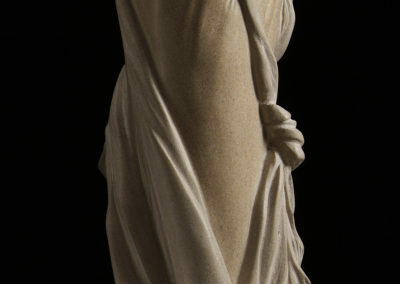 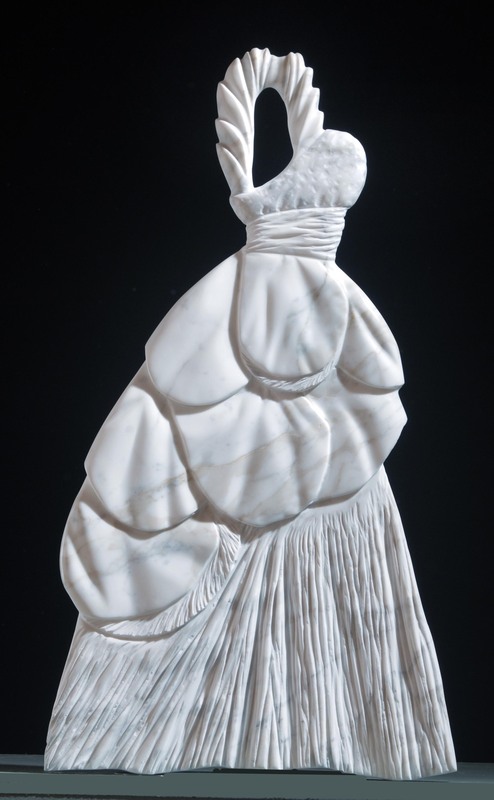 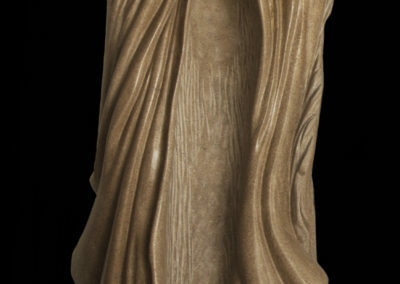 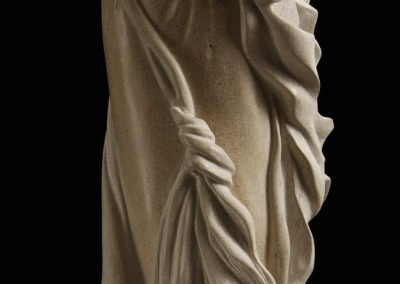 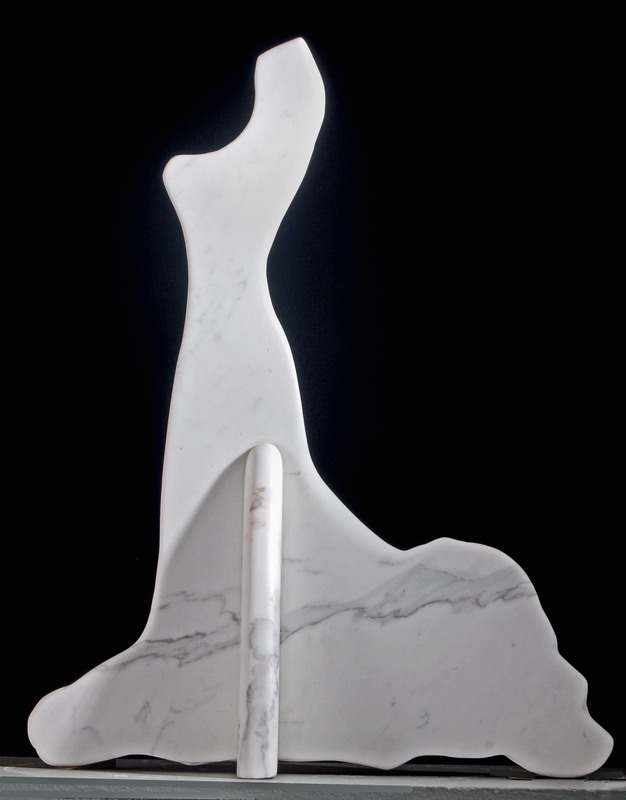 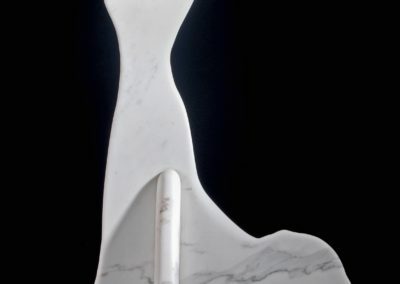 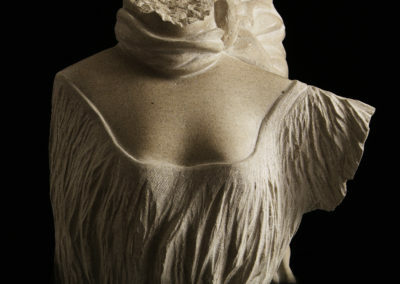 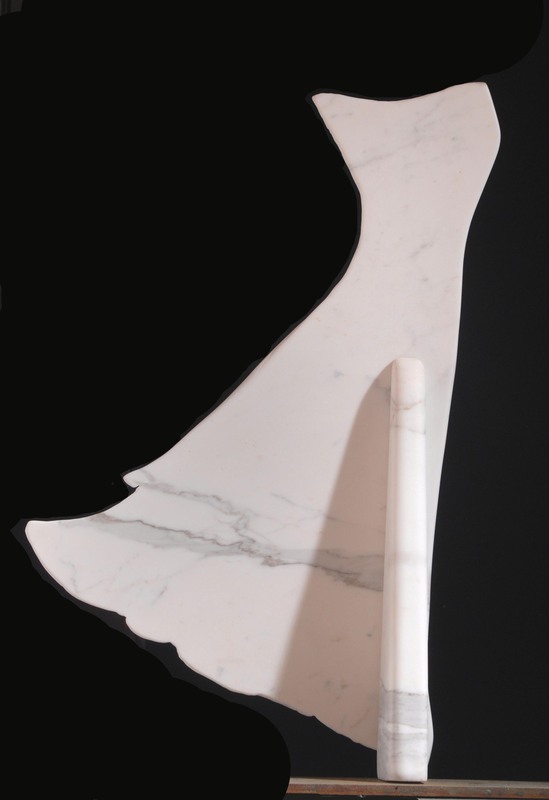 A part of the “Robe of the Goddess Series” are the “Paper Doll Dresses “, thin sheets of marble with relief carving of dream dresses, with support stands in marble, like the paper ones of the 40’s and 50’s. 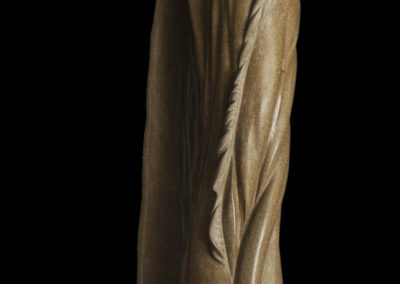 Before ‘Barbie’ there were paper dolls. 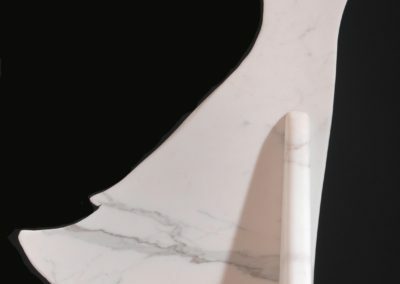 Many women have the memory of cutting out, coloring and dressing those paper dolls. 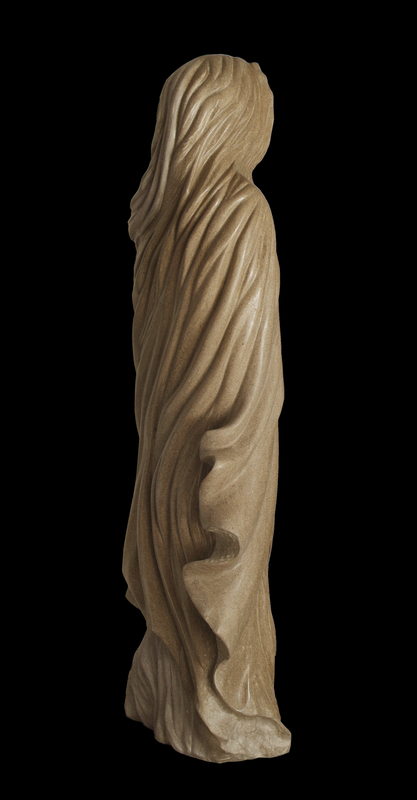 The marble dress and support are based on .5 inch steel plate with a warm rust colored patina.